Reforming Modern to fit the Reformation! I am a mad thrifter. In fact, I rather prefer cobbling my costumes together from recycled raiment rather than sewing them from scratch. It’s an exercise in patience– a cycle of search, discovery, rejection, appropriation, and reinvention. Some eras just lend themselves to being thrifted– Edwardian costumes, Regency costumes, 1920s costumes, even Medieval costumes– but 16th, 17th, and 18th century costumes are more difficult. These eras (much like the Civil War era as well) often involve massive amounts of fabric, especially for upper-class costumes. Modern clothing just doesn’t have that kind of volume outside of wedding and other formal dresses. Another challenge is the fit. During these three centuries, the “pair of bodies” and “stays” became premier undergarments. Stays are much different from a bra and 19th century corsets. Stays have a conical shape and flatten the chest, a style that is almost the antithesis of the 21st century silhouette! I am not sure if this painting is properly attributed. This women looks nothing like the famous Lettice Knollys. Perhaps they share a name? If you know who this lovely lady is, please let me know! 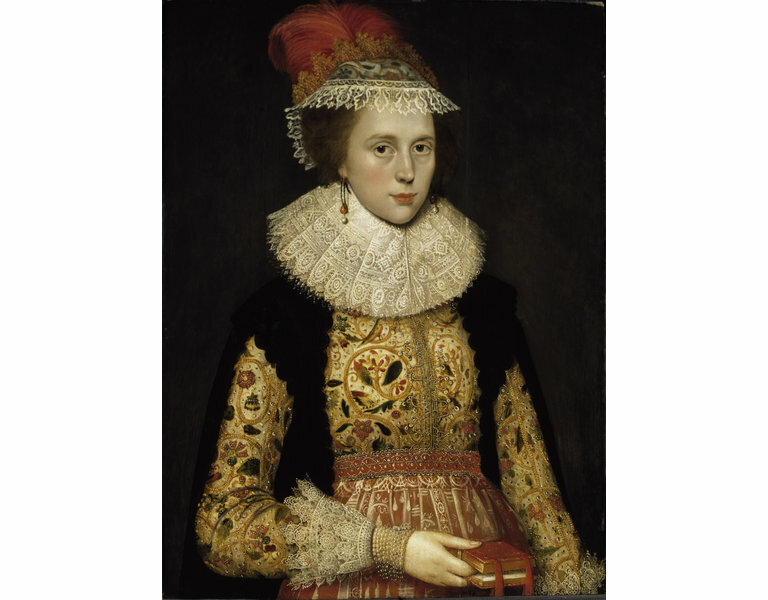 This portrait is famous for having the matching jacket along with it! During the 17th and 18th century, there was a huge market for cast-off clothes. Once the higher nobles got tired of their older finery, they would sell it to lesser nobles, who in turn would pass it on to merchants, and so on until it passed to lowly peasants such as myself. 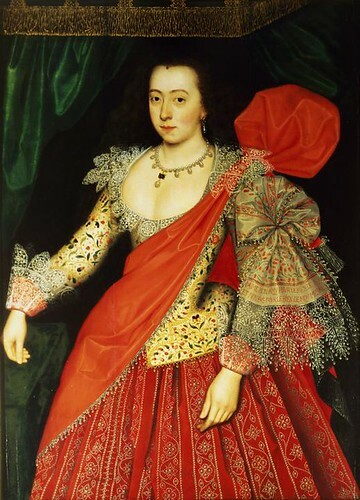 So in the spirit of 17th century thrift, I set myself the challenge of finding just such an outfit! First, thoroughly research what time period/decade/character you wish to emulate. 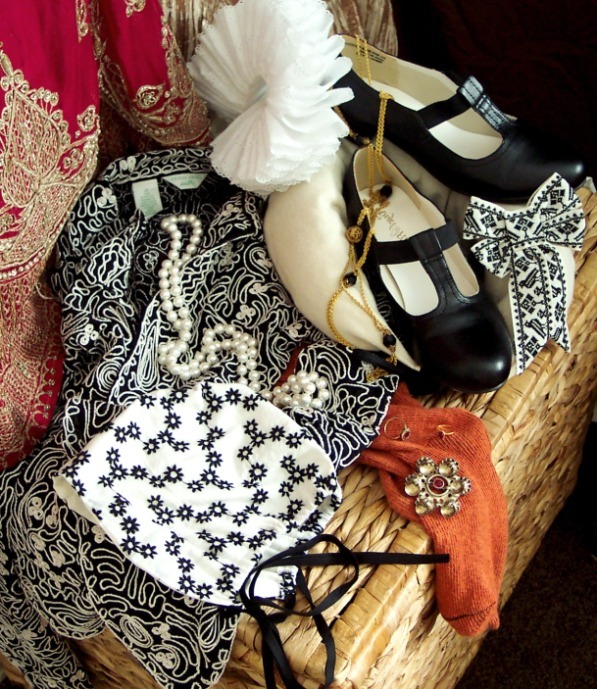 Familiarize yourself with popular fabric patterns, trims, and most importantly, silhouettes of the era. 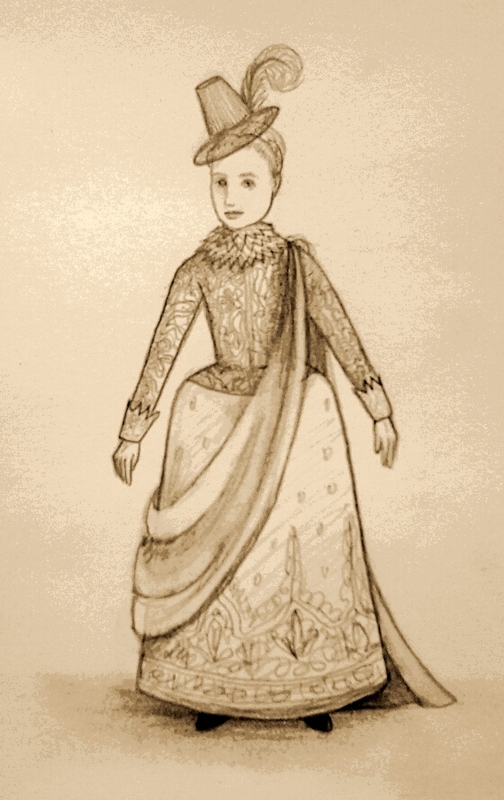 You cannot construct a historical costume if you don’t know what the finished product should look like! Second, browse through everything, including what you already own. For the “easy” eras mentioned above (Edwardian, 1920s, Regency, etc. ), little to no alteration may be needed to make a garment look period, but if you find something too big, it’s easy to take it in. Keep in mind what you learned during your research. You may find the perfectly shaped skirt, but if it’s lime green splashed with orange roses, you may have to pass on it. Other situations can be remedied with a little work: Can you re-cut that jacket? Would that too-small dress work if you were wearing a corset or girdle? Should you dye that maxi skirt a darker color? 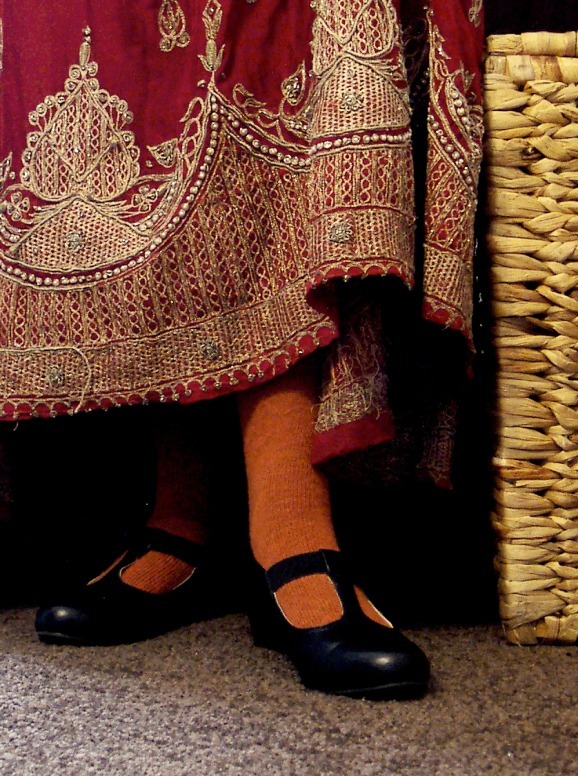 Can you use that ugly skirt for a petticoat? Could that old pillow be used as a bustle? Goodwill always has loads of silk and linen shirts for cheaper than buying yardage! Third, accept that unless you are lucky enough to find a period piece that fits you, your costume will not be “historically accurate.” You are taking modern (or vintage) clothing and manipulating it to look historical, so construction and materials will probably not stand up to museum scrutiny. In this case, it’s all about looks. So do not worry if you find the prefect 1970s-does-Edwardian dress, but it’s made from nylon lace. If it looks the way you want it, buy it! Polyester is not a pariah in the presence of a pragmatic penny pincher! 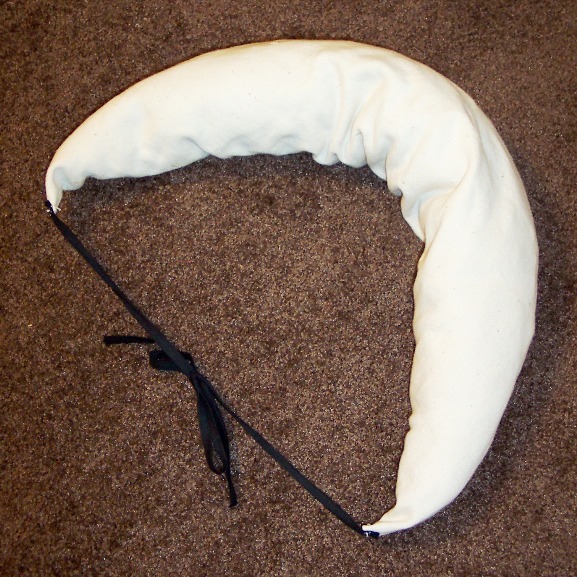 I just cut a crescent shape out of the fabric, sewed it like a pillow, and stuffed it full of fabric strips and scraps (hence the lumpy appearance compared to a roll stuffed with polyfill or cotton). The ties are double-fold bias tape left over from making my coif. I particularly like my cheap eBay corset because it is pretty tubular. Normally this tubular shape would be a detriment to a corset’s function, but in this case, the conical shape works very well. It’s the closest thing to mas-manufactured stays I have found! I also donned my slightly-too-small blackwork coif. This is the seller’s photo. 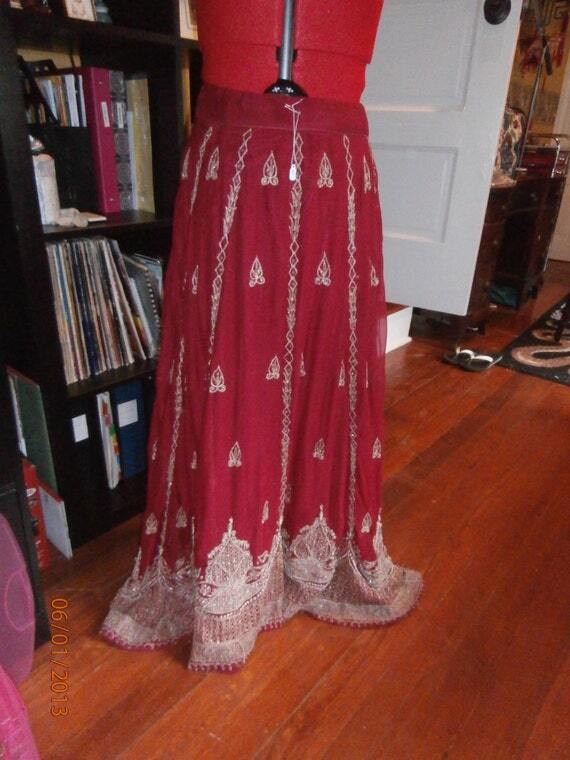 She makes belly dance costumes and is very nice! 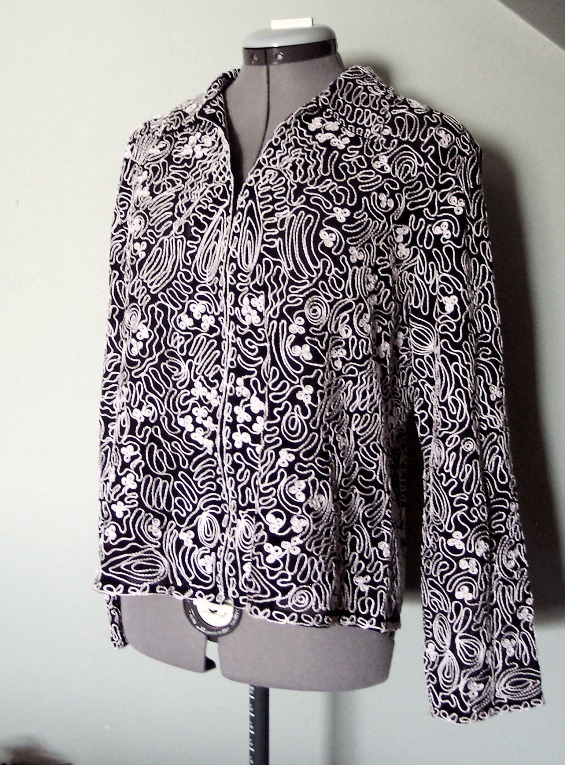 Laura Mellin made a beautiful jacket based off this one by hand! It’s truly incredible! This one gave me shape inspiration. 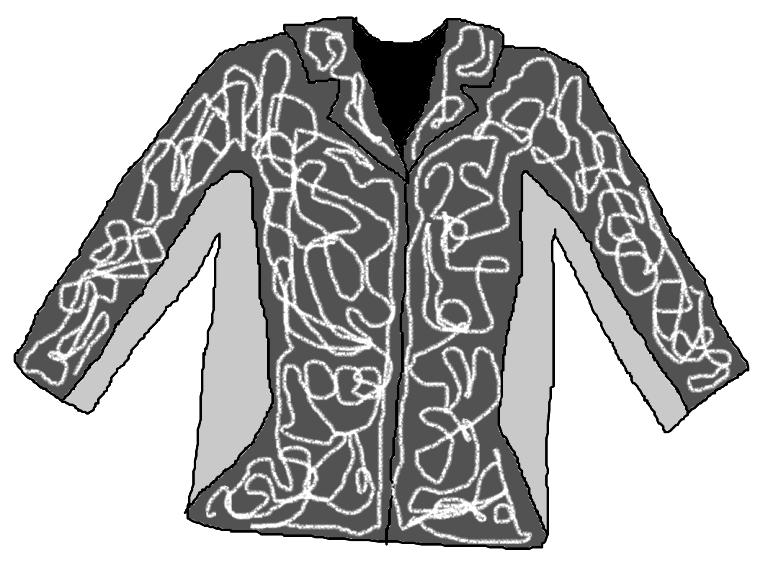 The grey areas indicate what I removed from the jacket. Modern clothes fit really loosely, especially under the arms. I had to go back and take even more out of the armpit to make sure it fit smoothly! Other than that, I did very little alteration. I even left the invisible zipper up the front of the jacket. Affixing my blackwork bow to the front helps hide it even further. 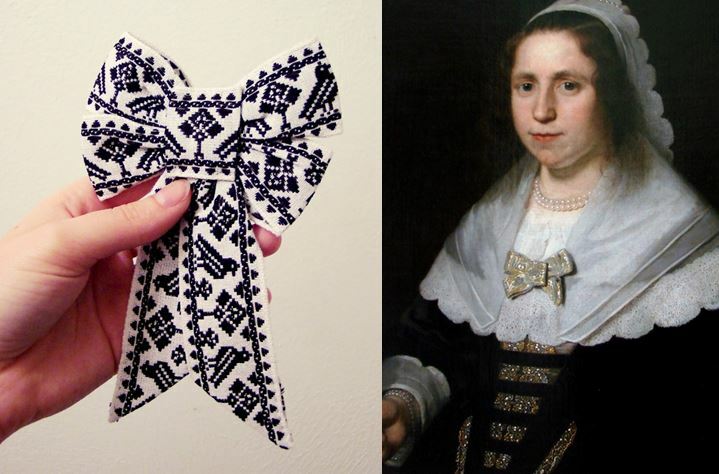 The 17th century was all about bows! 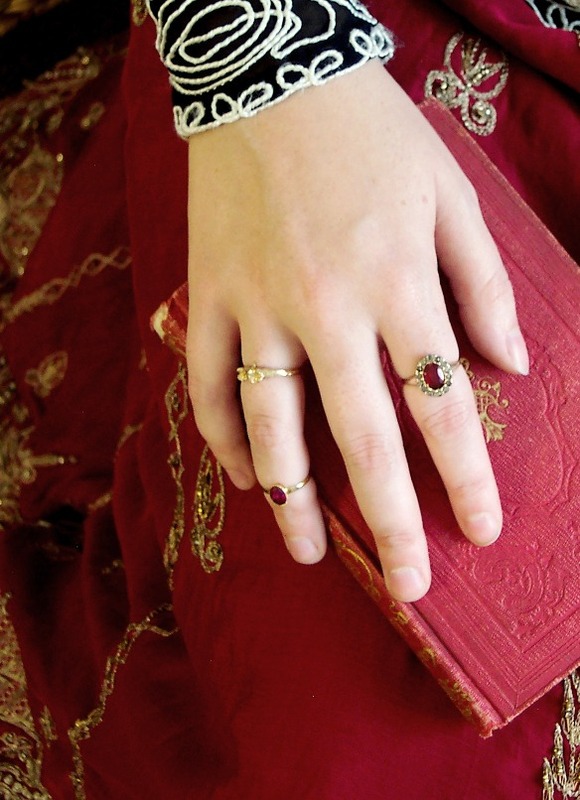 I enjoy wearing all my jewelry all at once (especially my second-knuckle rings)! I still need to make a pair of cuffs for the sleeves. I was worried about finding some proper shoes, but as it turns out, these simple t-straps (“Jean” by Angel Steps) are just perfect! They have a low heel and come in wides, plus the elastic isn’t obvious and provides great comfort when walking. Many of the reviewers had ordered them to dance in. I had some difficulty ordering them since they went out of stock and no one at the company notified me. They also call you with a pushy sales pitch for insurance which I promptly declined. If you can find someone other than AmeriMark/BeautyBoutique to buy from, let me know! I love these shoes, but I don’t love the company. This is a list of everything that went into making this costume and how much it cost. I’m only including items unique to this outfit since almost every outfit I wear has the same basic undergarments! All the jewelry is from my collection. It took me about three months to assemble everything for this costume. It was a labor of both laziness and love. I hope to keep adding to it, perhaps making cuffs, fashioning a classier ruff, adding a hat, making an apron, and adding either a shoulder drape or one of those sleeveless overdresses you commonly see worn in portraits of ladies in embroidered jackets! Love It – and thanks for keeping the costing soooo reasonable. Gives us all motivation and inspiration. AND… You look fabulous! Wow and double wow! I must learn to see the potential in things as you do; what a fabulous result! How did you make the ruff? Have you got a blog article about it or, if not, do you intend to do one. It’s great! Brilliant bit of thrifting and brilliant costume. Also good advice for school plays/AmDram groups. This is impressive! I stumbled over your blog only yesterday, and when I read this post today I thought all the time, meh.. that’s not going to work… and then I saw the picture of the finished outfit and was totally stunned how well it works! You have a true talent there. Complete with thought process, costings and re-use. Costuming on a budget is something I feel strongly about (and am very interested in). What a fantastic outcome. I’m officially tripping out over how awesome this is. The jacket is incredible! The fit is perfect! I’m just going to go in a corner and squeal a bit more, then be overcome with envy…don’t mind me! I especially love how the jacket turned out. I’m with Rhissanna, this would be the perfect approach for a school play. 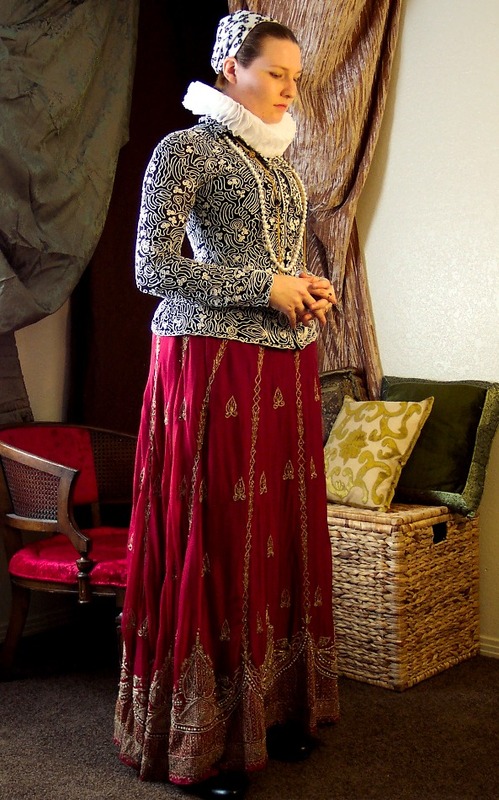 Also, for a costume party, since it’s unlikely most people would ever decry the lack of period fabrics (or even know). this is a great idea! I make costumes for a very small opera company, so budget is a factor. thank you for the info. I was skeptical when I read that you used “big ol’ ugly backstitches” and I was so happy to scroll down and see how great it looked – brilliant! Thanks for sharing your experience! 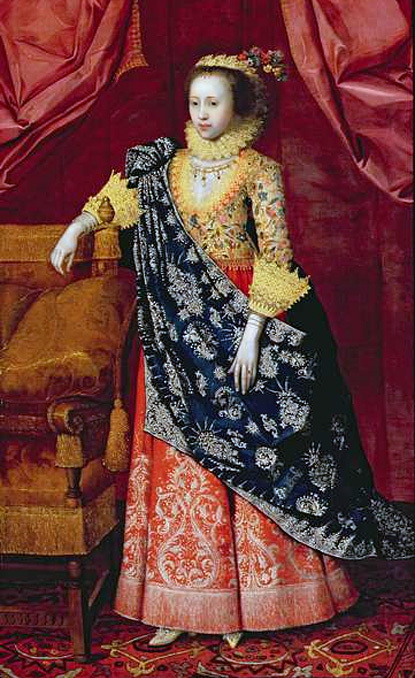 Arabella Stuart, Lady Lennox (1575-1615). I most often see her called Arbella and the surname sometimes spelt ‘Stewart’. At one point she was a contender for the English throne in the case of Elizabeth the first’s death. Lots of reasons why that didn’t happen one of which is she wasn’t politically clever enough. Wow! This is genius! Great job! 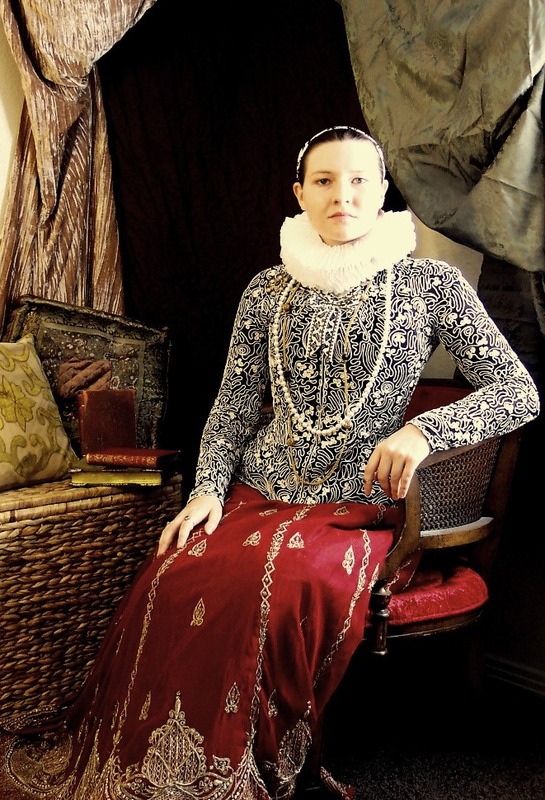 Liz, I come back to your blog again and again – this time for inspiration for a quick-and-dirty Tudor outfit for a school history day. I couldn’t face making a full-on kirtle but a coif, drawstring skirt and a fitted-to-the-wearer bodice (including big ol’ ugly backstitches) has done the trick. Thank you!